On the eve of InfoComm, Barco has just announced that laser light source video projection expert Bill Beck has joined Barco’s projection development and marketing efforts. And to kick off his role at Barco, Beck will be on hand next week at InfoComm to present Barco’s new laser-illuminated cinema projector– at the Display Summit that runs Monday and Tuesday in Las Vegas in conjunction with InfoComm. Beck’s presentation will be on the “Laser Day” of the Summit, Monday June 16. 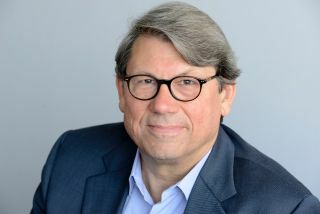 As a photonics entrepreneur for more than three decades, and co-founder and former chairman of the Laser Illuminated Projector Association (LIPA), Bill brings in-depth knowledge of laser technology and the specific requirements for its application. Pete Ludé (at podium) was wearing his LIPA (Laser Illuminated Projection Association) hat, when he gave an update on the regulatory issues for laser projectors at the Cinema Summit at NAB in April, as session moderator Bill Beck (seated at right) presided. The Laser Illuminated Projection Association recently announced major news surrounding the regulatory issues for high lumen laser projectors. Over the past few years the industry has been waiting to see if FDA regulations about use of laser devices were going to hold back the technology. Complicating that is the fact that currently the FDA says that laser projectors fall under their rules for “Laser Light Show Variance” i.e. they have considered laser illumination for projectors as lights, not lamps. This has not been a deal-breaker for high lumen laser projectors as it’s possible today to get the “variance” with a bit of paperwork from the FDA to install a projector, but it’s been a speed bump. But major news broke in March when the IEC approved the new Edition 3, for the International Standard. This new standard carves out a separate category for laser projectors, and treats them as lamps. This will create smooth sailing for high lumen laser projectors going forward.